Hello from beautiful Napa Valley! I spent the better part of the weekend on the Culinary Institute of America with the USA Dry Pea & Lentil Council learning about pulses, cooking in their gorgeous kitchens, and gaining some serious skills in gluten free/grain free baking! I’m leaving feeling inspired and so very thankful to be chosen as an ambassador for the 2016 International Year of Pulses! That’s right, this year the United Nations declared 2016 as the year of pulse and I’m thrilled to be able to create recipes using some of these powerhouse foods! This past weekend I learned that pulses can aid in weight and belly fat loss, heart disease prevention, and reduce your risk for certain types of cancer. Amazing, right? I’m also a huge fan of the nutrition pulses can enhance your diet with. Each serving of pulses can contain up to 10g of plant-based protein, plenty of fiber, folate, iron and potassium. If you’re interested in learning more, you can take the pulse pledge (which is committing to eating a serving of pulses each week) by visiting PulsePledge.com! This particular recipe was created due to my insane love for sloppy joes! I know it sounds strange, but the flavor of the sauce is full of comfort for me. It reminds me of my childhood and everytime I eat sloppy joes I’m convinced that I need to make a SJ food truck. Anyone else? Of course, in true Ambitious Kitchen fashion I’m all about taking a traditional recipe then adding a creative twist, and making it as healthy (but still as tasty) as possible! This week’s challenge: Create a vegetarian sloppy joe recipe with lentils instead of beef and use a homemade sauce from scratch (NO MANWICH)! 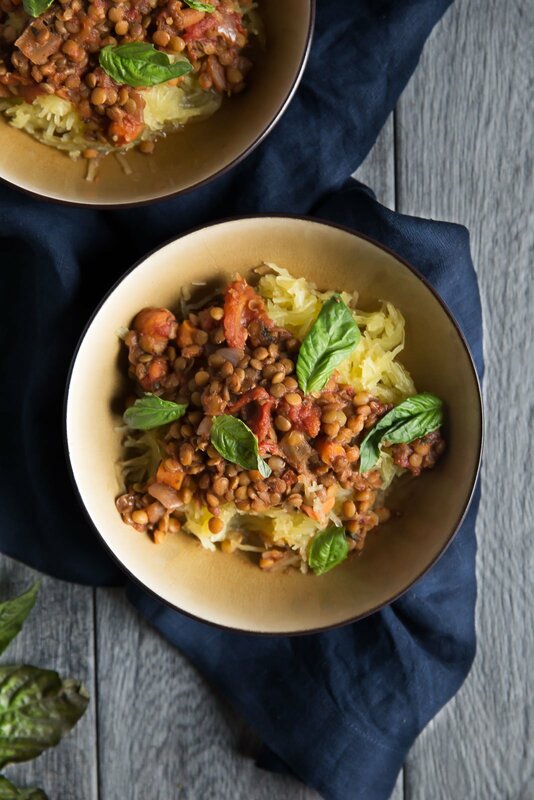 The lentils in this recipe add such a nice meat-like texture, and are simply perfect served on spaghetti squash with a little extra sauce. I realize most people probably think of sloppy joes on buns, but I’ve been having a major crush on seasonal squash lately and couldn’t resist throwing it all in the slow cooker together. Surprisingly, you wouldn’t believe how filling, cheap and easy this meal is. 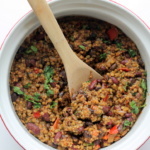 The 15g of plant-based protein and fiber help to keep you full and satisfied while the slow cooker makes prepping this meal less than 10 minutes! I highly recommend this recipe for a weeknight– it makes great leftovers for lunch the next day too! 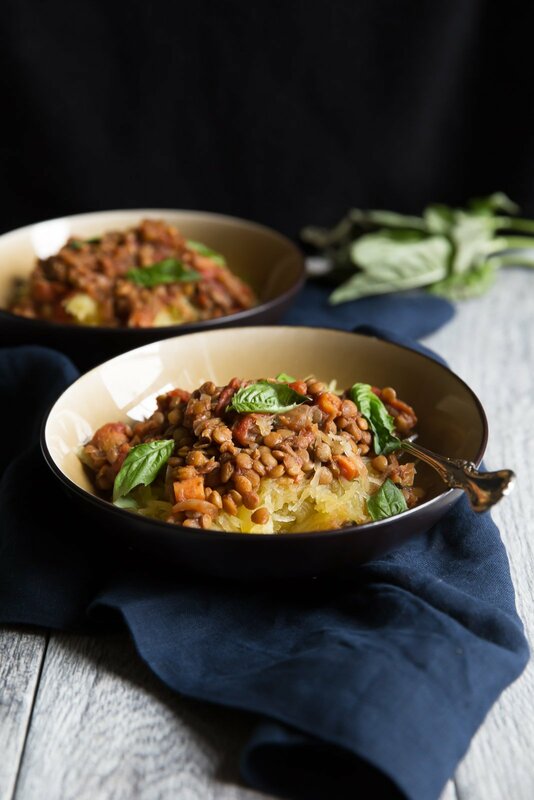 Protein and fiber-packed vegetarian lentil sloppy joes served on top of spaghetti squash. Everything is made in the slow cooker for ease -- even the spaghetti squash! Vegan and gluten free! In a large slow cooker, add in all ingredients except spaghetti squash. Stir to combine. Cut the washed spaghetti squash in half around the middle and scoop out the seeds. 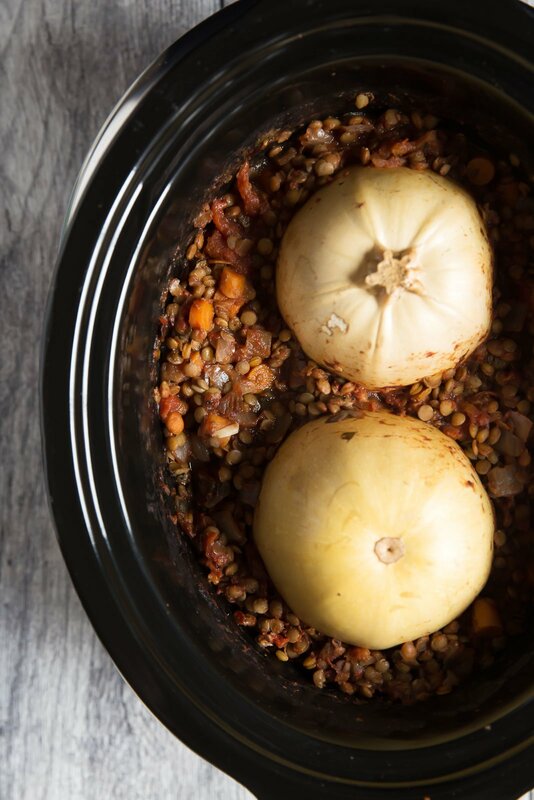 Place the squash halves face down in the slow cooker right on top of the lentils. Cover and cook on high for 4 hours or until squash is tender and lentils are cooked completely. If the lentils seem dry in any way, just stir in some water until it reaches a nice thick, consistency. Remove spaghetti squash and shred inside with a fork. Divide among bowls and add lentil sloppy joe topping. Sprinkle with cheese, if desired. Serves 4-6 depending on how hungry you are. Nutrition information provided is based on recipe evenly divided between 4 people. 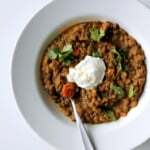 What to do if you don't have a slow cooker: I would assume that you could just cook the lentils on the stove top in the sauce instead of on a slow cooker. Saute vegetables with a small amount of olive oil, then add in the remaining ingredients, bring to a boil, cover, reduce heat to medium and simmer until lentils are tender -- about 35-45 minutes. Uncover and cook longer if more liquid needs to be absorbed. To cook spaghetti squash: Cut in half, scoop out seeds, and place on a large baking sheet lined with parchment paper. Bake at 375 degrees F for 45 minutes to 1 hour. This post is in partnership with the USA Dried Peas and Lentils Council. All opinions and thoughts are my own. Thanks for continuing to support AK and the brands that help make this site possible! 51 Responses to "Vegetarian Slow Cooker Lentil Sloppy Joes over Spaghetti Squash"
Yea I basically want this right now. I’ve had so much fun following your trip!!! Enjoy lady! This is so clever! I’ve had a bad experience with spaghetti squash since I didn’t know how to cook it properly, but now I think I can give it another chance! This is my kind of meal!! LOVE! I was lucky enough to have visited CIA in Napa twice, still can’t believe it. What a truly amazing experience, not to mention beautiful area. So fun and love this recipe! I’m such a huge fan of lentils and peas! 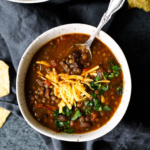 I LOVE lentils and especially love them as a meat substitute – they have the perfect texture. Cooking the spaghetti squash in the slower cooker with it is a seriously genius move. Sounds like a great trip! 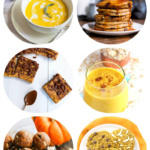 Also, such a great recipe when you’re craving something “bad” but still want to be healthy!! This is the perfect meal for my boyfriend and I! Come to find out he LOVES lentils and spaghetti squash. I can’t wait to make this for dinner! Loving the look of this dish! It’s so convenient that it’s all cooked together too. Mine needed more than 4 (and a half) hours, but I had another meal lined up for my slow cooker so I had to move the operation out to the stove. The lentils weren’t as done as I like, and it was more soupy than sloppy (even though I drained my tomatoes and only did a cup and a half of water, did not add more). I ended up nuking the spaghetti squash for five extra minutes (it was just a small one too) and put the rest of the contents of the crock pot in a stock pot to simmer uncovered for 25 minutes to thicken things up. Also, I grew up on Manwich, so I added a couple packets of stevia for a little of that old familiar sweetness. It’s a tasty recipe, but I think next time I’ll skip the slow cooker method and do it all stove top/oven. For whatever reason, reviewing this on my phone isn’t letting me give it any fewer than 5 stars, though I tried to give it 4. I’m sorry to hear that. What’s odd is that I’ve tested this recipe several times in my slow cooker to make sure that it was correct! Did you put the slow cooker on high for 4 hours? Low for 8 hours should also do the trick. One last thing I’m wondering is what kind of lentils you used? Thanks — depending on your response, I can certainly test the recipe again. I’ve got a bag here of Simple Truth Organic brand green lentils, found in my Dillons grocery store (owned by Kroger, I believe). I’m pregnant so I suppose it’s possible I set it on low instead of high, what with pregnancy brain, but I’m pretty proficient around a kitchen and I can’t really imagine making an error like that. I’ll certainly try the recipe again (I’m eating it for dinner right now, very tasty leftovers :))! Back to Her Roots has a non-slow cooker version of this recipe! I’ve tried it and it’s awesome. 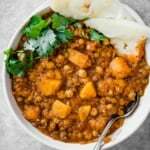 Can I use red lentils? I have those in my kitchen already! You outdid yourself on this one! We had it tonight, and I thought it was fabulous. I followed the recipe exactly except for the water. I was lazy and just filled up the tomato sauce can with water and dumped it in. I also found it took slightly longer… closer to 5 hours. No biggie though. Could not have been easier. You go girl. Made thIs in a Clay Pot tonight. Absolutely DELISH! We used acorn instead of spaghetti squash and added a tiny bit of honey. Topped it with Gruyere cheese and avocado… Delicious! Just made this!!! Made the whole house smell amazing. And the taste… Perfection!! Came over here from Buzzfeed–this looks good! I love lentils. 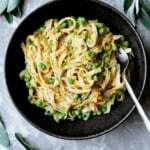 Would you recommmend this recipe with butternut squash instead of spaghetti squash? I’d like to try it with butternut, but afraid it won’t cook through. I made this yesterday(after making your chili potato topping Saturday) and it turned out so good, even for the meat-eaters in my family. I was going out yesterday, so I put it on low for six hours instead of high for four, and then it was probably done but I went ahead and flipped it to high for half an hour. It was really tasty, and the spaghetti squash and lentils cooked perfectly. In fact, I don’t think I’ve ever managed such perfect, non-mushy lentil morsels before, hah. Thanks for another great recipe. So happy to hear, Kristen! There is definitely an art to cooking non-mushy lentils 🙂 Glad you (and the meat-eaters in the family) enjoyed! I’m so glad you enjoyed this one! And yes – cooking them separately works perfectly fine 🙂 These aren’t your traditional Manwich sloppy joes! Enjoy your leftovers! 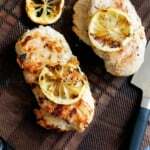 Has anyone tried adding some ground turkey or lean beef to this recipe to increase the protein? Try my turkey sloppy joes recipe here! I’m new to vegetarian cooking and eating and these sloppy joes weren’t quite what I’ve come to expect of a sloppy joe. I guess I’m used to a little different sauce flavor. However the flavor really reminded me of chilli and I love just eating this like a chili instead. Hits just the right spot and I’m certainly going to be looking to tweak this some to possibly include the kidney beans that makes for a classic chili flavor. Thanks for giving me a great base to play and experiment with! Do you think you could do this in the instant pot? I actually haven’t tried it, but let me know if you do! I cooked this in my instant pot. I started the onions on Saute and added the other vegetables. I added the lentils and the rest of the ingredients, including the whole spaghetti squash, and set it for 15 minutes. Since I didn’t drain the tomatoes, it turned out too juicy, so next time I will add less water. I also subbed barbeque sauce for the ketchup since I was out of it. The squash turned out fantastically with no struggling to cut it. I could peel the skin off with my fingers after it cooled down. Great! Glad this worked in your instant pot.